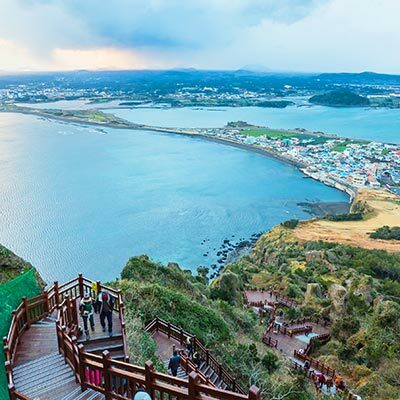 Jeju Island, South Korea’s southernmost island, is famous for its large, dormant volcano Hallasan – a UNESCO World Natural Heritage site. A paradise for nature lovers, the island boasts an enormous national park, pristine beaches and one of the most famous lava tunnels in the world. The island is famous for its beautiful beaches. Surfers flock to the colourful Jungmun Saekdal Beach, which has the best waves, and swimmers and sunbathers have their pick of numerous beaches, including Emerald Bay, Gwakji Gwamul, Hamdeok and Shinyang. Take a dip in the plunge pool of Cheonjeyeon Falls, which cascades from the ceiling of a cave, or stand back and admire Jeongbang Falls, the only waterfall in Asia that falls directly into the ocean. 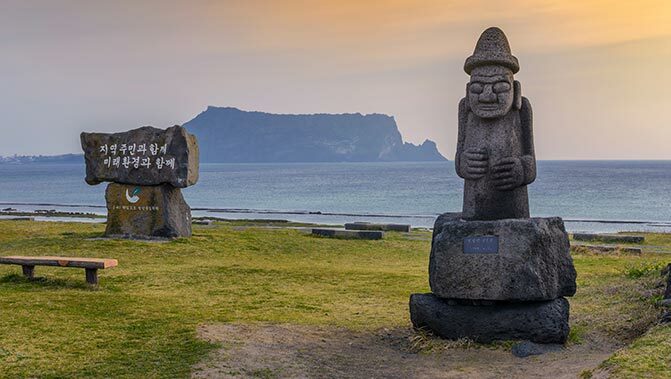 To learn about the island’s history, head to the Jeju Folk Village and explore more than 100 traditional houses with 8,000 century-old artefacts. You can also get your fortune told there. The “Old Grandfather” stones are a must-see. Carved by masons in the 1750s to scare off invaders, they are an enduring symbol of a rich ancient culture. 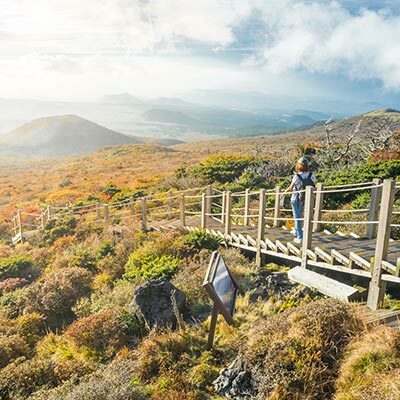 Early risers will love Seongsan Sunrise Peak at dawn, while the awe-inspiring Manjang Cave – a UNESCO geopark – beckons with eight kilometres of lava tunnel. Those whose tastes lean more to the cuddy should visit the Teddy Bear Museum, covering the famous toy’s 100-year history, and housing unique exemplars such as a Mona Lisa teddy bear and the teddy bears of the Last Supper. 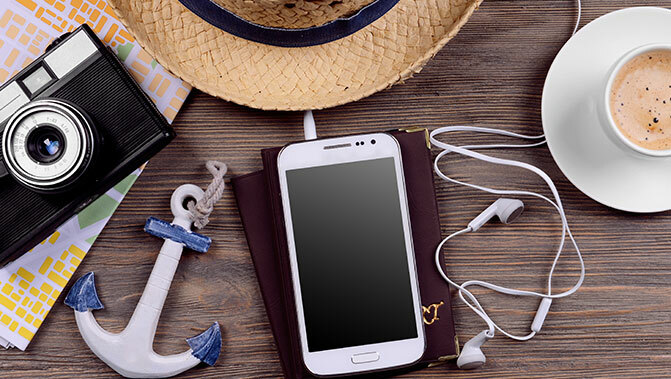 Being an island, Jeju enjoys fresh and plentiful seafood. 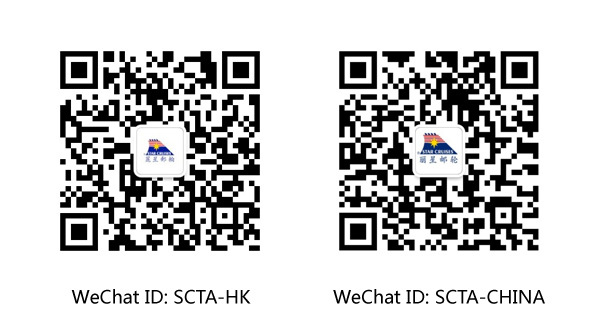 For an authentic taste of local culture, try some seaweed and sea urchin soup or whole grilled mackerel in sea salt. Other local specialties to sample include pheasant and barbecued pork from Jeju’s black pigs.